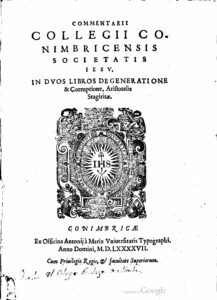 Published in a third phase of publication (by the Printer António de Mariz, in Coimbra, 1597), but composed already within its second phase, as explained in the introduction written for the Parva Naturalia volume, the Commentarii Collegii Conimbricensis Societatis Iesu, In duos libros De Generatione et Corruptione Aristotelis Stagiritae was composed by the Portuguese Jesuit Father Manuel de Góis (1543-1597). With all the necessary privileges and licenses, dating the earliest one of September, 24th 1592, i.e. of the same day that the three members of the Counsel of the Inquisition, António de Mendonça, Jacob de Sousa and Marcos Teixeira signed their permission related to the volume of Physics, the volume On Generation and Corruption took three more years to receive all the required authorizations, and only on June 14th, 1596, was the formal publishing agreement signed, between the representative of the College of Jesus, Pedro Gonçalves, and the actual publisher, António de Mariz (AUC IV-1ªD-25-3-11). The last necessary authorisation dates from December 23rd 1595, by Jerónimo Pereira and Damião de Aguiar, acting on behalf of the Senate, i.e., nineteen days after the authorization by the Count-Bishop of Coimbra, D. Afonso de Castelo Branco. This one, as well as the members of the Inquisition, João Correia, Luís de Sotomaior and Rui de Góis, all stated, as they should, that the Commentaries had nothing against the Christian religion and the good customs. The volume reproduces the King’s Privilege dated from 1572 (August, 25th according to the volume on Dialectica). We have no explanation to give concerning the evident delay affecting the publication of On Generation and Corruption: three years between its final composition and the reception of the last authorizations (1592-95), and more or less two years between this reception and its publication (1595-97). Another thing strikes the modern reader: On Generation and Corruption is the more carelessly edited of the all titles of the Coimbra Jesuit Aristotelian Course (see its non-exhaustive Errata and the various pagination misprints). The editio princeps was published with 545 pages (245x185mm) and follows the same method of the Physics, On the Heavens, and On the Soul and Dialectics afterwards, viz. publishing the Latin version of Aristotle’s text surrounded with the philological section (explanatio) and the various questions, all divided into several articles. The volume opens with a summary of all these chapters and questions and finishes with an Index of subject matters alphabetically ordered (26 pp). Due to its total number of pages (545pp), the volume On Generation and Corruption comes immediately after the Dialectica, the larger one, and the Physica and the De Anima. With the exception of the volume of the Dialectics, On Generation and Corruption publishes in its cover the logo of the Society of Jesus, with the Latin motto, “Nomen Domini Turris Fortissima”.